It’s the holy grail of writers app: a perfect palm-sized place where you can both plan and write your entire novel from beginning to end. 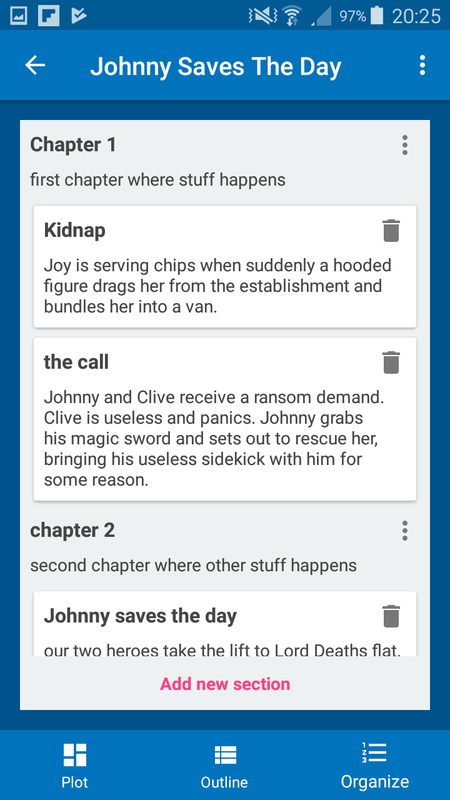 All the fun of Scrivener on your phone. If you’re an Android user, you’re probably beginning to despair of the hope you’ll ever find an app like it, especially if you’re looking for one that won’t break the bank*. Well, dear writer, here’s the good news: you’re not strange. I, too, despair of the hope of ever finding such an app. It was in this context that I downloaded Storywriter by Raindrop for Android but the question is: did it deliver? Anyone who has ever tried to write a novel with a mobile app knows that many apps boast functionality but are fiddly to use, especially on a phone. There’s often just too much stuff crammed in and it makes the app untidy and complicated. Not so with Storywriter. This app is so neat and tidy that you can jump straight in to using it without a moment’s fuss. That alone makes it worth paying attention to in my book. Even an idiot can open it and intuitively know exactly how to use it in about ten seconds flat. I simply haven’t got the words to describe how ridiculously intuitive this app is. You just make a new project by giving it a name and then boom! 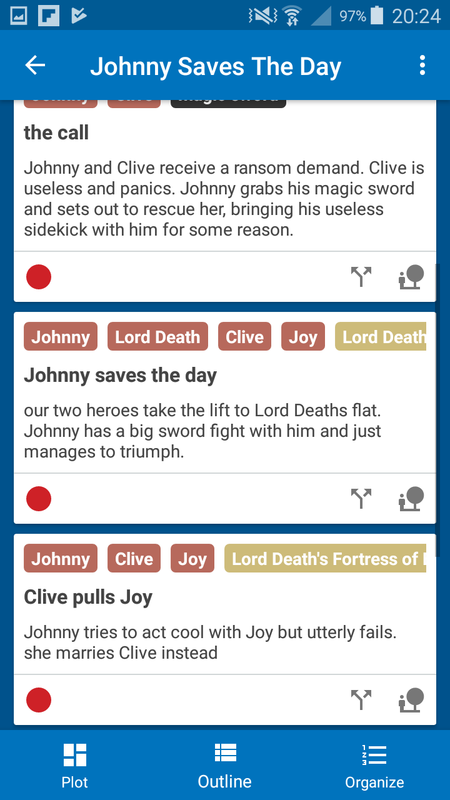 A nice, easy way to write chapters, storylines, character bios and general ideas all in one place. I can’t fault it for it’s layout or ease of use. Each project is divided into four sections: Chapters, storylines, characters and ideas. These all work in exactly the same way. 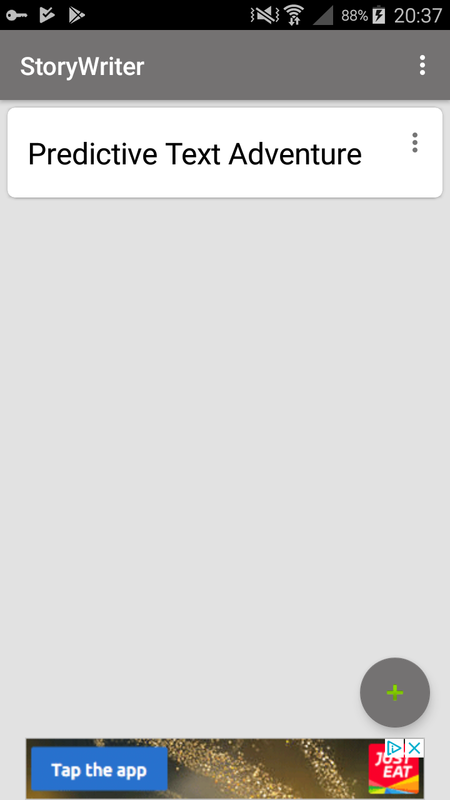 You add a new chapter or character by tapping the button at the bottom and you’re given a blank document to write on. There’s no meta-data or anything like that (for example, if you create a new character, you won’t be prompted to type in names, DOBs, genders, etc). In fact the only differences I’ve been able to find between the four different document types is that smart enter only seems to work on chapters. 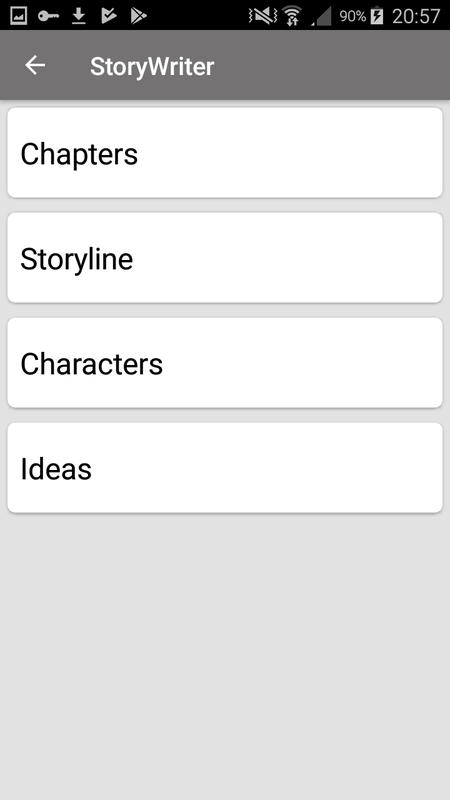 Apart from that, you could just as easily write your chapters in the character screen or write your characters in the ideas screen. They’re pretty much exactly the same in every way that matters. So far, I’ve made much of the simplicity of this app. Of course, if we dig a little deeper we will discover that this app does boast a few additional features, such as night-mode; the ability to alter the font and line spacing; ‘smart enter’, which automatically provides you with inverted commas** for a line of dialogue and a similar feature which automatically closes any parentheses you might use (for example, if you type an open bracket ‘(‘, Storywriter will automatically provide the closed ‘)’ one). Most of these functions are obviously cosmetic and can be toggled on or off from the app’s settings menu. Like most things in this app, the menu is clear and simple to use. I have only got one problem with it: you have to return to the home screen to access the menu. That means if you’re halfway through writing a chapter and decide you would really like to turn off smart enter or change the font size, you have to save your chapter, press ‘back’ to come out of your chapter, press ‘back’ again to come out of your list of chapters and then press ‘back’ a third time to come out of your story altogether. Only then can you access the menu. And then, once you’ve done whatever you wanted to do, you have to re-open your story, re-open the ‘chapters’ list and re-open the chapter you were working on. It’s needlessly time-consuming. There is an ‘upload’ function, which I’m guessing is for backing up your work(?) but it’s honestly not clear to me where my work has been uploaded to or why. You need to log in with your Google account to use it and then to sit through an advert so I don’t know how much it’s worth wasting time with this function but it exists and apparently works. This app does have ads, though they sit unobtrusively down at the bottom of the screen for the most part. There are a few infrequent full-screen ads but you can skip these (unless you try to ‘upload’ a chapter; then you’ll be forced to sit through a full screen video-ad before it will let you upload anything). And of course, if you really can’t bear to look at a little advert at the bottom of your screen, you can always use this app offline and save your work to your device. All in all, a decidedly okay app but with buckets of unrealised potential. As it stands, it’s pretty decent for a freebie but not quite the miracle I was hoping for. I hope the developers will continue to work on it because with just a few improvements here and there, this could be really a wonderful app. *The yWriter Android app looks alright but I ain’t spending £4.19 on app I can get for free on my PC. **British English writers take note: smart enter automatically provides the double inverted-commas (“”) more commonly used in American English. Thanks for taking the time to read this post. Be sure to leave us a wee comment if you enjoyed it and don’t forget to ‘like’ this post and follow us so you never miss another post. You can also follow Penstricken on Twitter and like Penstricken on Facebook, if that’s what peels your tatties. If you’re anything like me, the bulk of your writing projects will be done on computer, probably using a purpose-built piece of novel-writing software like Scrivener. Nevertheless, as I’ve mentioned before, there are some stages of the writing process (especially in the early days of planning) where I find the only way to make any progress is to sit down with a physical notebook and pen and scribble all my thoughts down. You might also be the sort of author who, like me, feels the need to keep a writer’s journal. Finally, if you’re like me, you’ll also be the sort of person who likes to hold on to every scrap of work you produce (including your brainstorm-scribbles) and keep it all neatly organised in one place. Which is a pain. After all, you can’t add your handwritten notes to your Scrivener project. 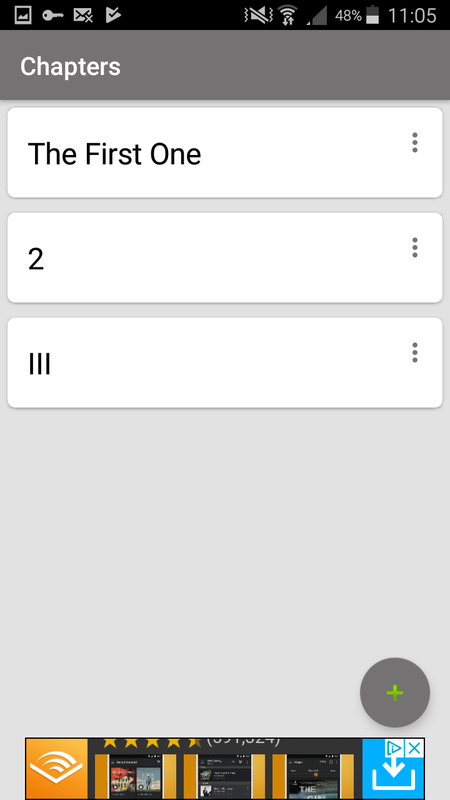 Let me introduce you to Notebloc for Android and iPhone. 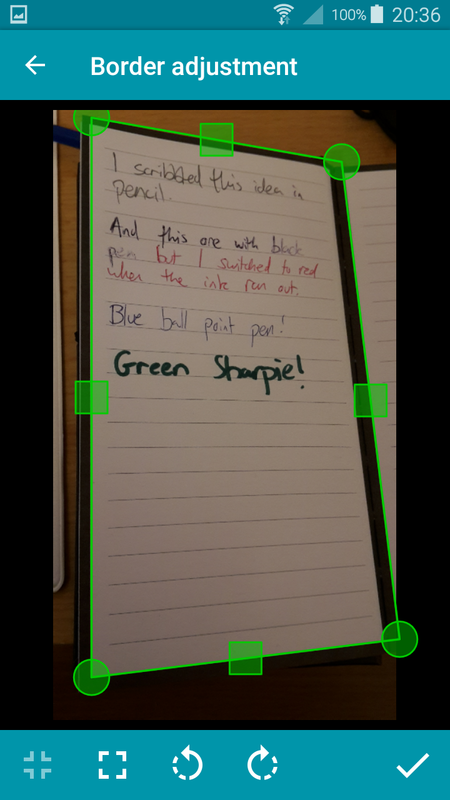 This handy little app not only uses your smartphone’s camera to capture images, but it also automatically adjusts the colour and angle of your image(s) before easily exporting them as jpg or pdf files, making adding your handwritten notes to Scrivener (or wherever it is you keep your project files) a breeze. I should note, I’ve only tested the Android version of this app. If anyone has used the iPhone version and found it to be different from what I describe here, do let us know in the comments. The first thing you have to do when you use this app is add images of your handwritten notes either by using your phone’s camera to capture an image or by importing a pre-existing image from your phone’s storage. Once you’ve done that, you will find yourself faced with an intuitive little screen (fig. 1) which allows you to adjust where the borders of your image should be. You can also rotate your image from this screen. So far, however, I’ve never had to actually do any manual adjusting; Notebloc does it automatically and with remarkable accuracy. However, in the unlikely event that it does not accurately identify the borders of your page, it’s a cinch to fix by simply long-pressing and dragging the borders to wherever you want them to be. Once you’ve done that, Notebloc will then automatically adjust the shape and colours for you to create an image which favours readability. As you can see from fig. 2, the image it produces is pretty darn decent. 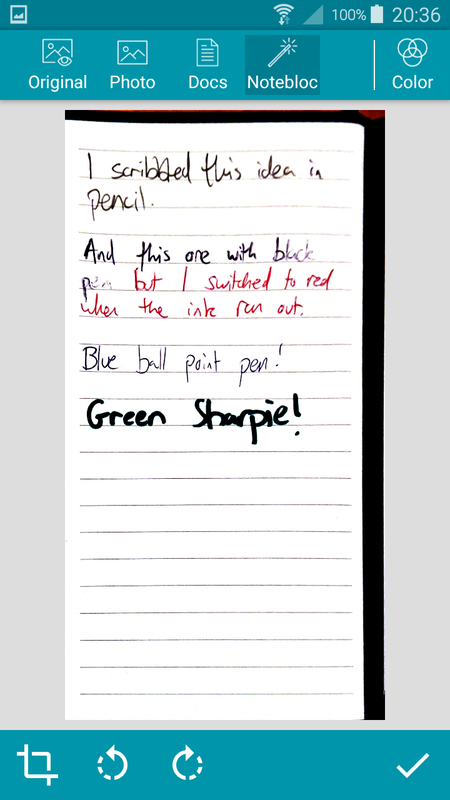 The text is still clearly legible (poor handwriting notwithstanding; it’s a smartphone app, not a magic wand) and the colours have been reasonably well preserved. It even handles pencil with surprising ease. If, however, you’re not satisfied with the way it adjusts the colours, there are a few other colour adjustment styles you can choose from (see the menu along the top of fig. 2). Once you’re happy with how the image looks, it gets added to your Notebloc document file (fig. 3). You can add as many pages to a document as you see fit and re-order the pages simply by long-pressing and dragging each page to wherever you want it to go (they will appear in the order in which you added them by default). From there you can print your document, share it online or copy your pages to another document if you so desire. Alternatively, you can do what I do and convert the document into a pdf or jpg format to be easily imported into your Scrivener project (fig. 4). I should add that if you opt for a jpg file, you will actually end up with numerous jpg files; specifically, one for each page. If, however, you opt for a pdf file, all the pages will be compiled into a single document, which makes it the best option for my money if you’re planning on adding it to Scrivener. I’m pleased to say I haven’t found any glaringly obvious bugs in this app and it does what it says on the tin to a fairly impressive standard. It doesn’t have much in the way of bells and whistles and while I generally think that’s a good thing (too many superfluous features make an app cumbersome), I do think it would benefit from a few additional features; character recognition being the most obvious. The tools for manually adjusting the shape and colours of your image could also be more flexible; as it is, your options are quite limited if you don’t like the adjustments it makes automatically. Oh and before you ask, this app is completely free and, best of all, it contains no ads. Go and get it! Thanks for taking the time to read this post. Be sure to leave us a wee comment if you enjoyed it and don’t forget to ‘like’ this post and follow us so you never miss another post. 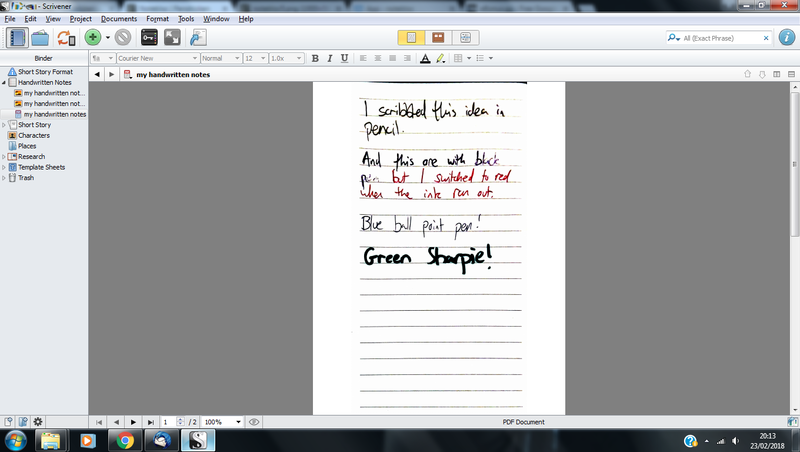 You can also follow Penstricken on Twitter and like Penstricken on Facebook, if that’s what digitises your handwriting. Can’t Afford Scrivener? Try yWriter. 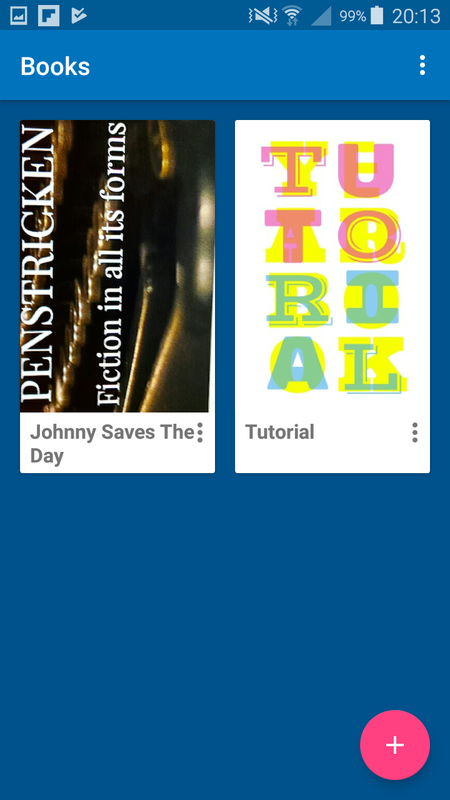 Many years ago, when I decided to make my first serious attempt at writing a novel, I did what a lot of enthusiastic beginners probably do: I searched high and low for the perfect novel writing app. 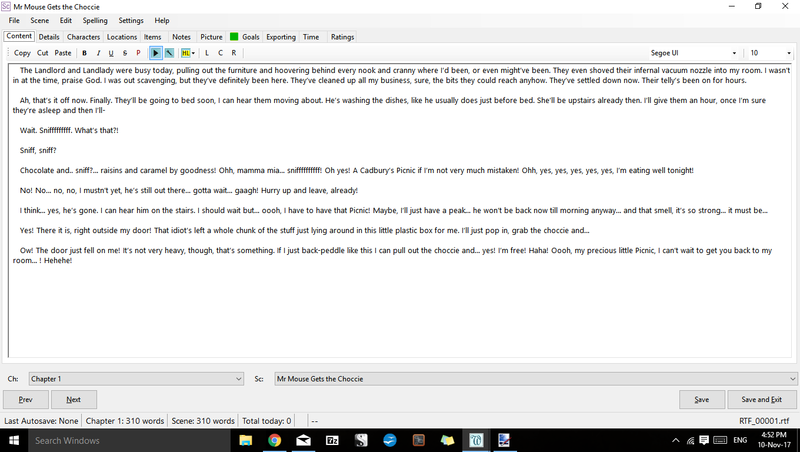 I didn’t know about Scrivener back then (in fact, I’m not even sure it was available for Windows at that time) but I did come across another app in a similar vein called yWriter by Spacejock Software. I attempted my first ever novel with it and I absolutely swore by it for a long time. Only the discovery of Scrivener for Windows really turned my head. However, in homage to auld lang syne, I’ve decided to download and review the most recent version of yWriter (specifically, yWriter6) for those of you who don’t want to spend any money (for there is no other good reason not to get Scrivener). yWriter’s main window (fig. 1) is, for the most part, fairly self-explanatory. 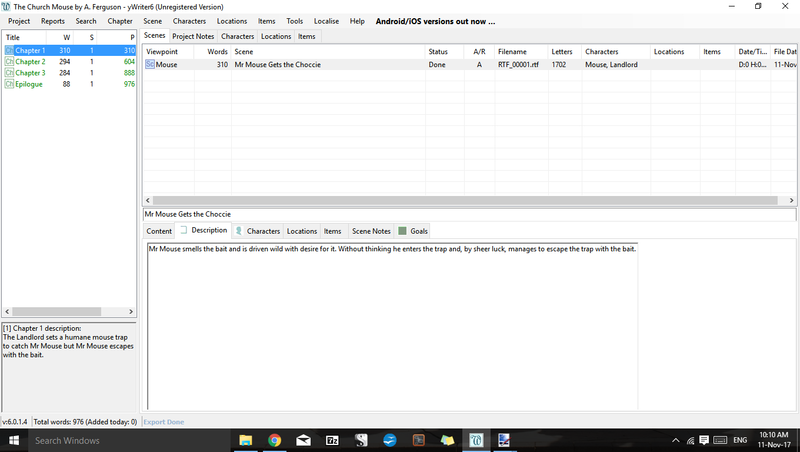 Like Scrivener, it allows you to organise your various notes on characters, settings, etc. and, like Scrivener, it allows you to organise your work into separate chapters and scenes. You can either begin with a blank project or you can use the project wizard… which is basically the same as making a blank project, only you begin by specifying the title, author’s name and file directory you want to save it to before you begin, thereby saving yourself thirty seconds later on. The window which you use to actually write your scene is also pretty self-explanatory for anyone even remotely familiar with ordinary word processors. Unlike many modern word processors, however, you are essentially restricted to writing in a rich text box rather than on a virtual page. As such, there is no easy way to format your page layout (rulers, margins, etc). However, in addition to the features you would expect to find on any word processor, you also have the ability to hear your story read out to you by Microsoft David or Microsoft Zira (a feature which can be handy for helping you to edit a manuscript you’ve grown overly familiar with) and there’s a whole host of tabs on this window which allow you to edit all sorts of information pertaining to the scene you’re working on, if you find that sort of thing useful. You can also easily jump from one scene to another using the drop down menus at the bottom of the scene editing window. Though this app is simple in many ways, and certainly lacks the flexibility of Scrivener, it does boast a plethora of handy little features which you can use or ignore as you see fit. I doubt if you’ll be inclined to use all of them and I don’t have nearly enough space here to mention them all, but suffice to say it seems pretty obvious to me that the developers have tried to appeal to a broad spectrum of novelists by adding a variety of tools. 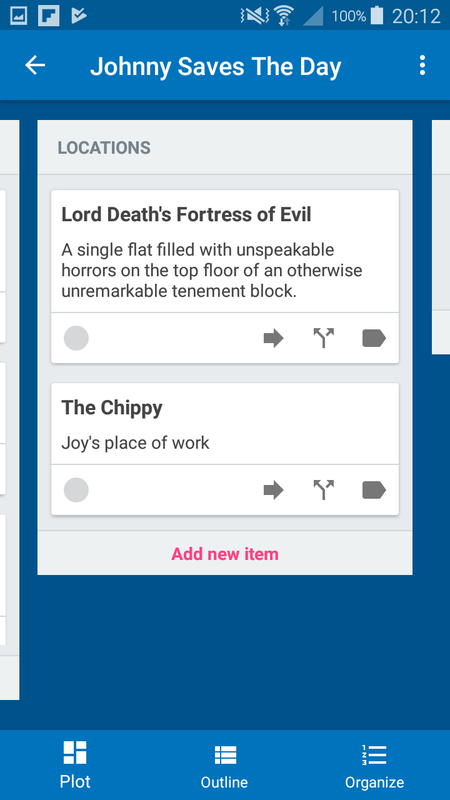 Personally, I am rather fond of the word usage window, which shows you a list of every word used in your story and tells you how often you’ve used it; a handy feature if you’re given to tediously repeating certain turns of phrase over and over again. In addition, the help menu includes a ‘writing tips’ option, which brings up a simple message window containing a snippet of handy writing advice such as ‘take a 5-10 minute break every hour. Walk, exercise, make a drink’ and ‘sometimes it’s quicker to rewrite a short scene from scratch than to keep editing it’. 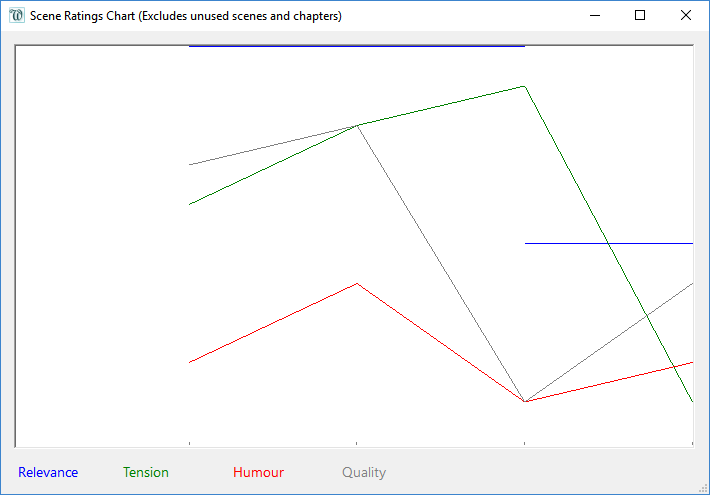 You can also rate the relevance, tension, humour and quality of each scene you write and collate that information into a handy-dandy line-graph (fig. 3), which could be a potentially useful tool when you come to edit your drafts (assuming you can be honest with yourself about the quality of your work). The tools for developing characters, settings and items which appear in your story are simple enough to use, if a little basic and inflexible, although there’s plenty of room for writing whatever notes you want. If there’s one major thing yWriter lacks, it is the ability to compile your manuscript into a suitable format for distribution. For instance, with Scrivener, you can easily compile your work into a variety of useful formats including (but not limited to) standard manuscript format, screenplay format or e-book format– and of course, if none of the presets appeal to you, you can customise your own format. You can’t do any of that with yWriter. It does allow you to export your project in a variety of ways, but if you’ve got any serious plans to submit your work for publication, you’ll need to transfer your exported project to a suitable word processor and format it yourself. I realise I’ve unintentionally spent a lot of time here comparing yWriter to Scrivener but I hope you won’t misunderstand my intentions. I really like yWriter. Yes, there is room for further development but I do think it’s worth trying, especially for new authors who are just dipping their toe into novel writing for the first time. Nevertheless, bells and whistles not withstanding, it is quite limited when it is compared to more expensive tools like Scrivener. My advice would be to give it a go. You may find yWriter is more than sufficient for your own particular needs, in which case you should be able to get your novel written and save yourself a few bob into the bargain. Thanks for taking the time to read this post. Be sure to leave us a wee comment if you enjoyed it and don’t forget to ‘like’ this post and follow us so you never miss another post. You can also follow Penstricken on Twitter and like Penstricken on Facebook, if that’s what sharpens your pencil.